We normally use rubber feed bins to feed the goats their grain and minerals. The rubber bins normally just sit right on the ground. The goats sometimes step in the bins and flip them over, spilling out any grain or minerals onto the ground. 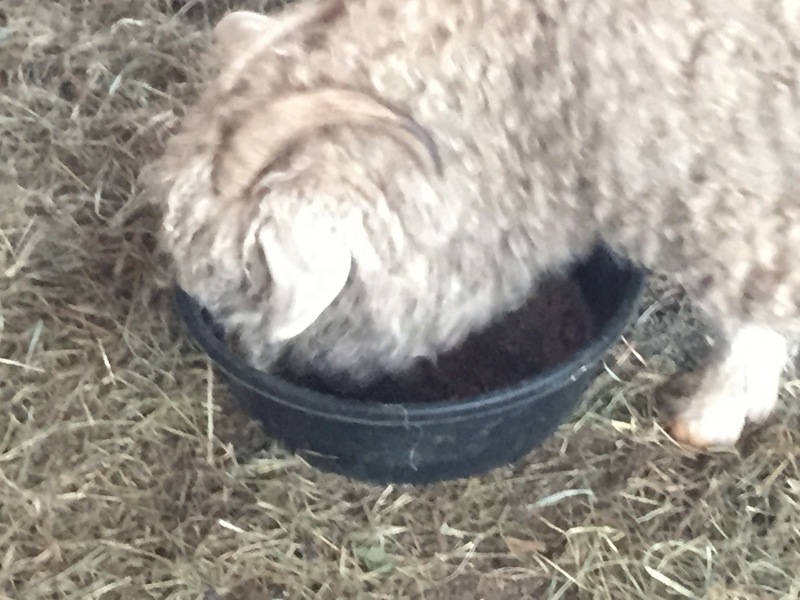 This wastes food as the goats typically refuse to eat most food that has touched the ground (except of course for live grass or other plants that they graze on…). Rosebud using a rubber feeding bin on the ground. I wanted to build a better feeding bin for the goats, but without having to spend a lot of money. Click through for a more detailed guide to build an elevated goat feeding bin. I got the idea to create an elevated feeding bin when we needed to have winter tires installed on our cars. 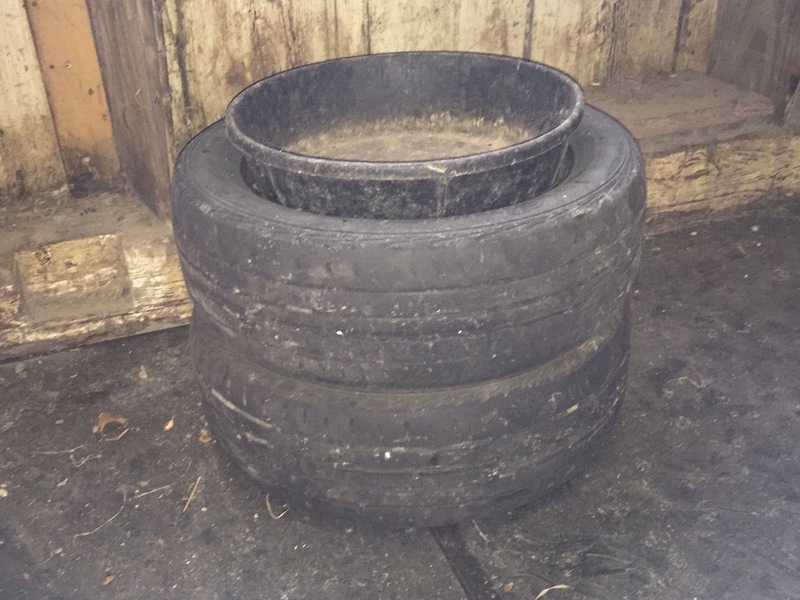 The old car tires were worn out and the tire shop wanted to charge $7 per tire for a tire disposal fee to recycle the old tires. 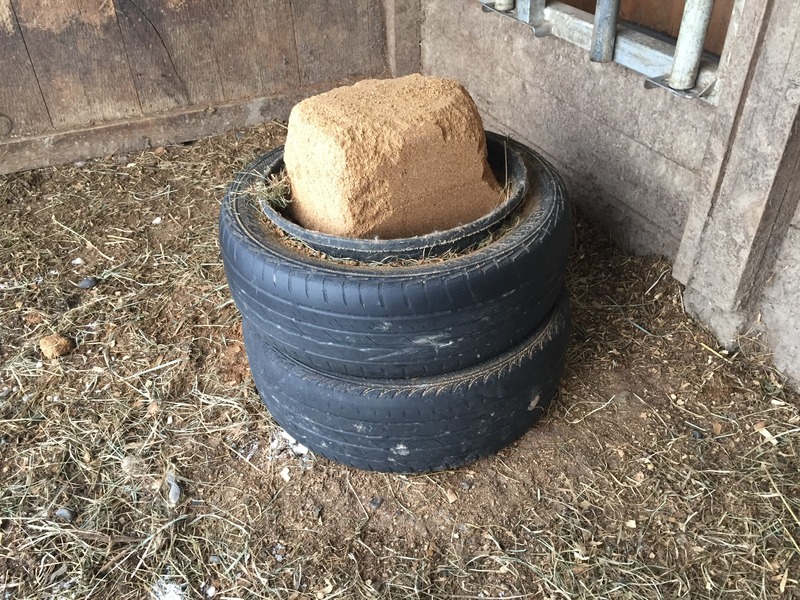 Instead of paying the tire disposal fee, we opted to retain the tires and make use of them around the farm. We washed the tires off as best we could to remove any oil or other chemicals. First, after setting the tires on their side, I drilled holes along the bottom sides of each tire to limit the potential for any standing water inside the tires once they were placed outside. I stacked the tires in two stacks of two high tires. Next, I drilled additional holes through the tires to connect the tires to each other so the goats couldn’t knock them apart. I used zip ties through the drilled holes to connect 2 tires together in a stack. The stack could be higher and it would only require more zip ties and more tires. Once the tires were hooked together, I inserted a rubber feeding bin into the top of the tire stack and it fit right in. The feeding bin is easy to move around the farm because you can simply turn it on its side and roll it from place to place as needed. We have been using one of the elevated feeding bins for over a month and so far the goats have not knocked it over at all. This has led to less waste of the mineral block because less is ending up on the ground or stepped on. As we already had the tires, the feeding bins and the zip ties on hand, the total cost for each elevated feeding bin was actually -$14 as we saved the tire disposal fee. We hope to create a few more elevated feeding bins with our next set of worn tires. This entry was posted in Animals, Farm, General Information and tagged animals, Costs, farm by Dan. Bookmark the permalink. Wish I had an elevated feeding bin! I hate stepping on my mineral block! You can create your own elevated feeding bin following the instructions in the post! If you are close by, I can make one for you if you have some old tires around.